Presidential candidates submitted their first quarter fundraising reports to the Federal Election Commission (FEC) and it's the first major barometer of who is breaking through in a crowded field and how well-resourced campaigns could be for the long race ahead. But amid the clamor to scour the latest filings for indications of who's up and who's down, it's important to remember that a good fundraising haul is no guarantee of votes or viability. And that uncertainty will continue to reign in the early stages of a historically diverse Democratic primary with well over a dozen declared candidates. The reports show an incumbent Republican president eager to build a war-chest sufficient enough to hold off any potential challenger, and a Democratic race that will undoubtedly remain competitive up until the first nominating contests in 2020. It is also important to note that while former Vice President Joe Biden has not officially entered the race, he is presumably a candidate who would draw major interest from donors of all sizes. Here are five major takeaways from the reports filed with the FEC. Sen. Bernie Sanders of Vermont topped the Democratic field in the money race with relative ease, bringing in an $18.2 million total haul, followed by Sen. Kamala Harris of California who brought in nearly $12 million. Former Texas Congressman Beto O'Rourke raked in $9.4 million in the first quarter of 2019, including a $6.1 million haul in the first 24 hours of his campaign, a total that surpassed even Sanders initial haul. 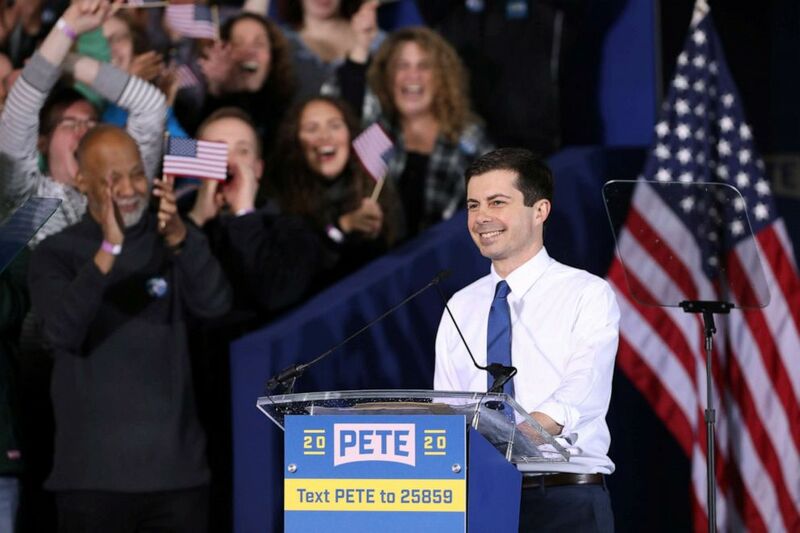 South Bend, Indiana Mayor Pete Buttigieg brought in an unexpectedly impressive haul for a candidate who is still introducing himself on the national stage. Buttigieg, who officially announced his candidacy this past weekend, brought in over $7 million in the first quarter from over 155,000 individual donors, outpacing the four other U.S. senators in the race and cementing his status as a top-tier candidate in the campaign's early stages. "Mayor Pete" also had a relatively low burn rate, spending just $685,000 -- or less than 10 percent -- of his total fundraising haul. South Bend's Mayor Pete Buttigieg speaks during a rally to announce his 2020 Democratic presidential candidacy in South Bend, Ind., April 14, 2019. Sen. Elizabeth Warren brought in just over $6 million, followed by her Senate colleagues: Amy Klobuchar with $5.2 million; Cory Booker with $5 million; and Kirsten Gillibrand with $3 million -- putting them all in the middle of the pack in terms of fundraising. In another surprise, entrepreneur Andrew Yang, who raised $2.4 million in the first quarter, outpaced two governors in the race, Washington Gov. Jay Inslee and Colorado's former Gov. John Hickenlooper. Yang also outraised as Hawaii Congresswoman Tulsi Gabbard and former Maryland Congressman John Delaney, who loaned his campaign $11.7 million. In terms of cash on hand, Sanders also holds a significant advantage over the field, with $15.7 million in the bank. The early numbers also revealed the advantage sitting U.S. senators -- who ran re-election campaigns in 2018 -- have over the field. Both Warren and Gillibrand transferred large sums from their Senate campaigns -- Warren $10.4 million and Gillibrand $9.6 million -- which gives them some more flexibility to spend more money early. Warren spent 87 percent of the money she raised from individual contributions in the first quarter and Gillibrand burned through 81 percent, both at much higher rates than the rest of the field. A big theme emerging this cycle is the emphasis on the number of individual donors giving to a specific campaign, both for its indication of a candidates' grassroots support and because it is now one of the main criteria set forth by the Democratic National Committee (DNC) for making the debate stage. Sanders again led the pack, announcing earlier this month that his $18.1 million came from 525,000 individual donors, well beyond the 65,000 required by the DNC and outpacing all of his rivals. Not all campaigns released individual donor numbers, but Warren said her haul came from 135,000 individual donors, while Buttigieg claimed over 155,000. Yang said his campaign had 80,000 individual donors to his campaign during February and March. Both Harris and O'Rourke's campaigns said their totals came from 218,000 individual contributions. According to the FEC filings, there were seven campaigns that raised a majority of their money from donors who gave $200 or less: Sanders, Warren, Buttigieg, Yang, O'Rourke, Gabbard and author Marianne Williamson. On the flip side, Gillibrand, Booker, Hickenlooper and Delaney all saw under 20 percent of their donations come from people who gave $200 or less. With a larger emphasis on small-dollar donations and a rejection of corporate money, expect the jockeying for the grassroots fundraising mantle to continue throughout the Democratic primary. 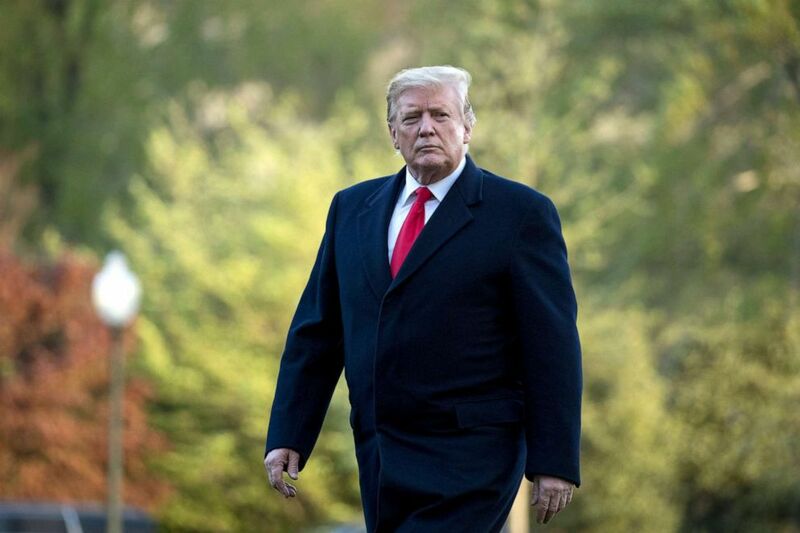 While the field of Democrats battled for fundraising supremacy, President Donald Trump's re-election campaign announced a more than $30 million haul in the first quarter of 2019, outpacing his top two rivals from the opposing party combined. According to numbers released Monday morning by the Trump campaign, the commander-in-chief took in $30.3 million and has $40.8 million cash on hand. President Donald Trump walks on the South Lawn as he arrives at the White House in Washington, April 15, 2019, after visiting Minnesota. The campaign did not release the number of individual donors to the president's re-election campaign but claimed to "have already enlisted 100,000 new small donors in 2019," and to have "acquired more than one million new small donors" since Trump was inaugurated in January 2017. As always, the first round of FEC reports provide a unique opportunity to see who is donating to which campaigns at the outset. 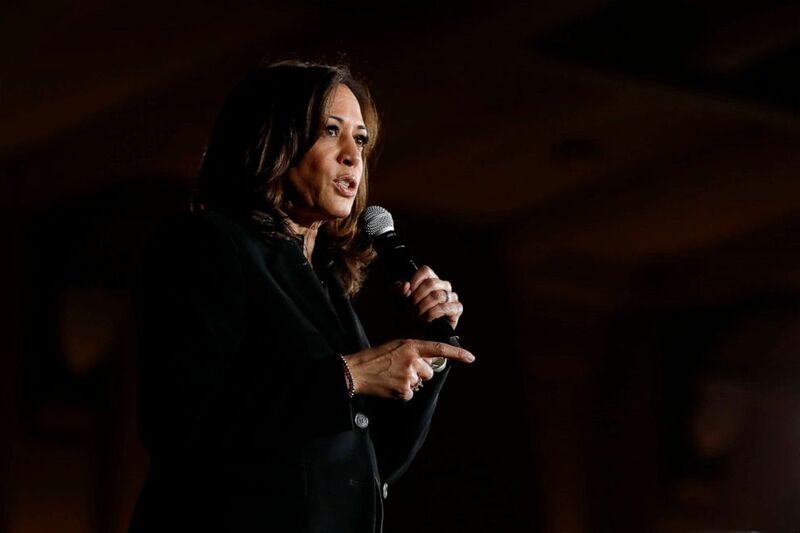 Harris, one of two California-based candidates in the race, received donations from a number of famous names, such as actors Ben Affleck, Reese Witherspoon, Eva Longoria, Jon Hamm, Wanda Sykes, Taran Killam and Jon Cryer, as well as producers J.J. Abrams and Shonda Rhimes. Democratic presidential candidate Sen. Kamala Harris speaks during a town hall meeting at the University of Iowa, April 10, 2019, in Iowa City, Iowa. Among Booker's most high-profile donors include NBA Commissioner Adam Silver, former Google head Eric Schmidt, New Jersey Gov. Phil Murphy and musician Jon Bon Jovi. Booker also received donations from actress Rosario Dawson, who he is currently dating. Sanders received donations from actors Danny DeVito, Susan Sarandon and Thomas Middleditch, as well as musician Norah Jones. Yang, who has seen an uptick in attention in part due to the online engagement in his campaign, received $1,000 donations from Twitter CEO Jack Dorsey, Weezer front-man Rivers Cuomo and actor Noah Centineo, who starred in the Netflix film "To All the Boys I've Loved Before." Buttigieg also saw a number of donations from famous names like actors Mandy Moore, Ryan Reynolds and Bradley Whitford, former national security adviser and United Nations Ambassador Susan Rice and James Murdoch, the son of conservative media titan Rupert Murdoch. Trump's over $30 million haul saw a wide range of donors, including one of his biggest backers in 2016, Robert Mercer. The prolific conservative donor gave $5,400 in the first quarter of 2019 to the president's re-election campaign. Many of Trump's most high-profile backers, like casino mogul Sheldon Adelson, donate to outside groups and super PACs backing GOP causes. Adelson and his wife Miriam donated over $100 million to GOP-aligned groups during the 2018 midterm elections, and are expected to be among Trump's biggest financial supporters during his re-election efforts. As the data continues to be scrutinized, there has been some worry among Democrats that these numbers, even for top-tier candidates like Sanders and Harris, are lower than 2008, which was the last time the party saw a competitive primary. In 2007, both Hillary Clinton and Barack Obama raised more than $25 million in the first quarter, albeit against a less-crowded field which may be causing some donors to pause before deciding who they are backing. 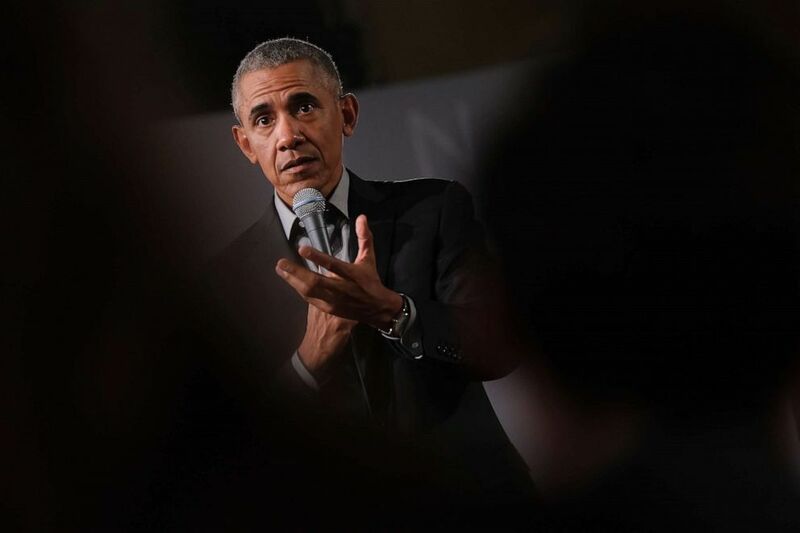 Former President Barack Obama speaks to young leaders from across Europe in a Town Hall-styled session, April 6, 2019, in Berlin. According to an analysis by OpenSecrets, a nonpartisan, independent and nonprofit outlet that tracks campaign finance data, the initial first quarter numbers appear to lag behind what the party saw in 2007. In additional to the potentially troubling overall numbers, both Warren and Gillibrand's early burn rates may signal difficulty in sustaining their campaigns all the way until the first ballots are cast in February 2020. Warren took a significant step when her campaign announced that she would not be holding high-dollar fundraisers during the Democratic primary, a decision that played well to a party base that is rewarding candidates who shirk the traditional norms of fundraising but may present a challenge to her when it comes to maintaining her war chest.